As one of the leading envelope manufacturers in the United States for both personal and commercial entities, Rite Envelope & Graphics, Inc. can perform envelope conversions using the paper you supply with custom converting to match your exact needs. With over 30 years of experience in the print industry, you can count on Rite Envelope & Graphics, Inc. to guide you in selecting the right layouts, die lines, and detailed information on your next converted envelope project. Envelope converting is an industrial printing term that refers to the process of transforming sheets or rolls of paper into envelopes. 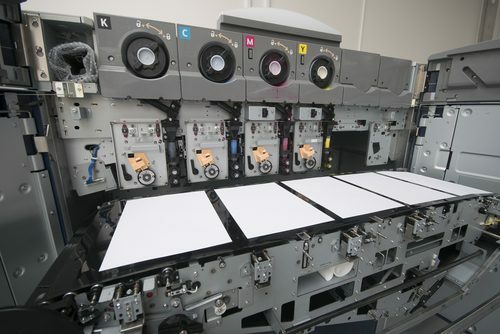 In essence, paper is converted into envelopes through a unique procedure involving multiple steps. After cutting, folding, and gluing is finished, the end result is a stunning, uniquely designed envelope which can be used for the mailing of any number of documents. While business envelopes are stock manufactured in various types and sizes, they are generally quite plain, and when ordered in bulk they often come with several variances. Such inconveniences not only complicate counting for distribution, but they also keep you from accurately representing your company brand or personal intention. Stock envelopes are produced in the millions, packaged in a warehouse, and stored until needed. They are sold to end-users and commercial printers for further modification and reselling. Custom envelopes are made according to an individual project, rather than on a massive scale for multiple buyers. They are created for customers that have needs which cannot be met by stock envelopes. Full Color: As stock envelopes only come in specific colors and sizes, many of our clients choose to have their envelope conversion project done with full color printing. From a specific shade to a logo or depiction, we can print almost anything on your custom envelopes. Interior Tinting: If you wish to have a dual-toned envelope, we can tint the interior and leave the outside white, or print both sides of the paper we use using different colors. This comes in handy for custom security tints. Unique Sizing: Non-standard sizing dimensions is a common requirement for our customers. When your document has proportions that don’t fit stock envelopes, we can make them for you. Window Positioning: Die-cut windows allow for a portion of each envelope’s content to be seen from the outside of the container, even once it has been sealed shut. You can order our envelopes with multiple windows, larger windows, smaller windows, or any other specification you might desire. At Rite Envelope & Graphics, Inc., our staff performs personalized, converted envelope printing for customers in all industries. Philadelphia restaurants first greet their guests with our color brochure-style menus. New York City executives send out their company letters in our matching stationery envelopes to clients in Chicago, Austin, and Baltimore. Automotive shops throughout Washington use our full-color printing options for flyers that are distributed to locals in our announcement envelopes. Regardless of what your business might be, we can assure you that our inexpensive envelope converting services will suit your needs and complement your tastes. …And everywhere else in the domestic United States! Potential customers and return customers can reach out to us online or by phone. Be sure to ask us to tell you more about the customizations we offer. Any inquiries regarding pricing, shipping, and more are always welcome. Our staff is more than happy to discuss any finishing touches you may have in mind.